Not loved as much as the Custom House, but Dublin's Four Courts with its very imposing presence on the North Quays, is an image I've painted and sketched many times. Never had any regard for the misplanted London Plane trees, so I chose not to paint them in. Since then, the Dublin authorities have removed many of those trees as ill-suited to urban space, replacing them with a better class of tree for our statues to talk to. 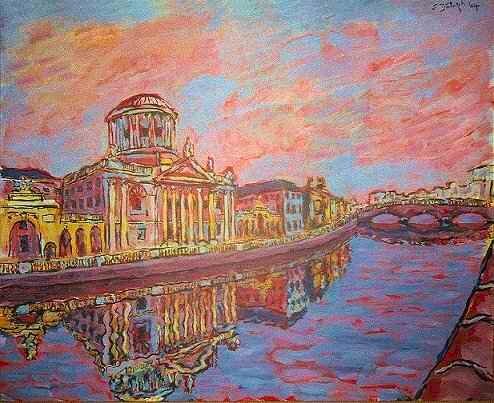 Using heavily watered-down acrylics, it is this version of the Four Courts that I am most happy with, to date.